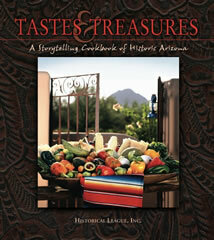 Our Historical League Tastes and Treasures Cookbook has colorful stories and recipes from historic properties found throughout the state of Arizona. The recipes range from the Cameron Trading Post on the northern border of Arizona to Rancho de La Osa in the south. There is a charming chapter on recipes and food memories from our Arizona Historymakers such as Barry Goldwater, Erma Bombeck, and John Rhodes, as well as the delicious recipes from "Lunch at the Museum." This book was named Southwest Regional Winner in the 18th Annual Tabasco Community Cookbook Awards. Only nine books out of hundreds from across the country are selected for this honor. "McIlhenny Company of Tabasco sauce is honored to play a role in celebrating the hard work of these organizations which help capture culinary traditions and make significant contributions to local charitable causes," said McIlhenny. "The true meaning of community is defined within each of these unique cookbooks." Tastes & Treasures was also a finalist in the following awards: ForeWord Magazine - Cookbook Category (2007), The Eric Hoffer Award: Notables- Home Category (2008), National "Indie Excellence" Book Awards: Cookbook Category (2008), and USA Book News Award: Cookbook - Regional Category (2007). A perfect Southwestern Arizona cookbook full of western food recipes and authentic western cooking. It will become one of your favorite cookbooks! No portion of this site, including photographs, may be used or reproduced without permission.